Chinese President Xi Jinping's visit to the restive western region of Xinjiang shows his government's determination to fight terrorism, papers say. Mr Xi's visit to the region, home to the Muslim Uighur minority, on Sunday was his first since he became China's president in 2012. The China Daily notes that Mr Xi promised to step up anti-terrorist efforts after a deadly knife attack at Kunming station that the government blamed on Uighur extremists. Twenty-nine people were killed and more than 140 hurt in the attack in March. The Beijing News notes that the Xinjiang region has high illiteracy and unemployment rates. "These problems might be the underlying cause for social conflicts, and the factors that induce separatism and religious extremism," it explains. The editorial further notes Mr Xi's emphasis on economic development and improvement of living conditions as well as promoting bilingual teaching (Mandarin and the Uighur language). 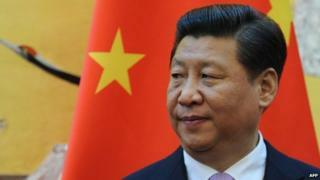 "Mr Xi's Xinjiang visit shows his resolution to face and find a solution to the problem. It is also an important signal to international and domestic observers that the central government is determined and will put in great effort to solve the main problems in Xinjiang," it says. An article in the Haiwai Net criticises the West's "double standard" on terrorism. It adds that China needs to adopt its own approach to deal with the problem. "It is difficult to gain support from the West. The West unwillingly acknowledged the Kunming attack as an act of terrorism a few days after the incident took place… In the eyes of Western politicians and media outlets, China's terrorism is a problem of ethnicity and religion, but not an act against humanity," it says. The Global Times' Chinese edition encourages people from other parts of the country to visit Xinjiang "more often" and help the government in developing the area. "Many are afraid to go to Xinjiang, particularly to the southern region. Let's be bold and visit the place… to connect with the Uighur society in a normal way, and help the different ethnic groups to overcome the feeling of being marginalised," it urges. Meanwhile, media call for greater co-operation among Asian nations as China prepares to host the 4th Conference on Interaction and Confidence Building Measures in Asia (CICA) Summit in Shanghai. The conference, chaired by Mr Xi, will run from 20 to 21 May. State leaders and delegates from at least 40 countries will discuss ways to deepen mutual trust and collaboration to build a peaceful and prosperous Asia, reports say. "We want to speak with one voice to the world: Asian countries should take the lead in dealing with Asian affairs because they have the capacity and wisdom to safeguard and promote security in the region," Foreign Ministry Spokesperson Qin Gang said. "To some people, Asia will achieve its security targets only when the US steps forward," the People's Daily notes. "However, such views are not in tune with the trend of the current world order… Only common interest and shared responsibility can achieve sustainable peace and development in Asia," it adds. And finally, cartoons of current and former Chinese leaders are on display at the 10th China International Cartoon and Animation Festival in Hangzhou. Caricatures of Xi Jinping, Hu Jintao, Jiang Zemin, Deng Xiaoping and Mao Zedong by artist Zhu Zizunat are drawing huge media and online attention at the festival which runs from 28 April to 3 May. "The leaders are handsome and cute," the Shanghai Morning Post quotes one visitor as saying. Shangguan Jiurui, Associate Professor from the Communist Party School of Shanghai Municipal Committee, tells the daily that Chinese leaders usually appear as "serious" and "mysterious" to the public, but these cartoons seems to have "drawn the public closer to the leaders". "Using cartoons to portray the leaders reflects that there is a fundamental change in political communication. These cartoons show a friendlier image of the leaders which is more easily accepted by the public," he says.